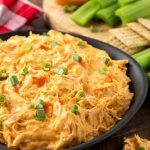 Slow Cooker Buffalo Chicken Dip is a favorite party appetizer! People love the spicy, creamy, cheesy flavors in this yummy Buffalo dip recipe. 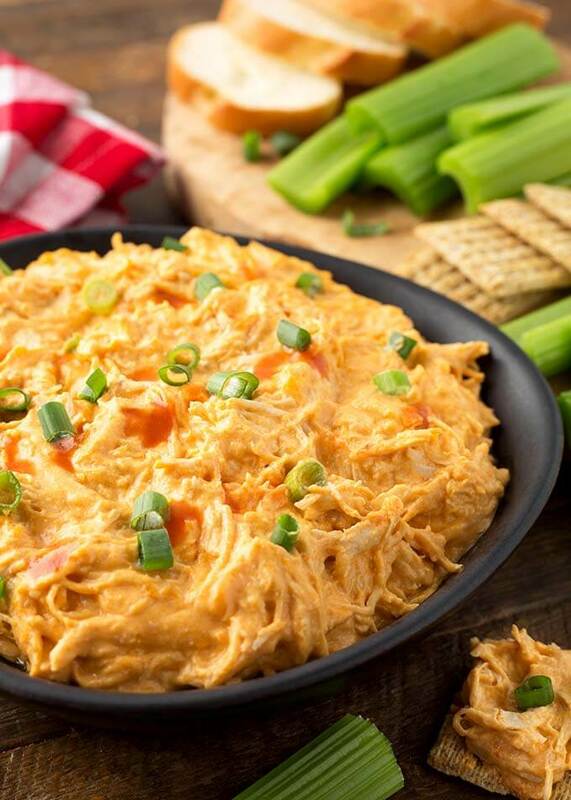 Serve this crock pot buffalo chicken dip warm, with bread, crackers, or veggies. Your guests will love it! Who doesn’t love a delicious party dip? You can go back and sample it as many times as you like, and it’s fun to eat! Today’s recipe is really simple and really delicious. Slow Cooker Buffalo Chicken Dip. This dip is a take on the popular Buffalo Chicken Wings, AKA Buffalo Hot Wings. The popularity of Buffalo Chicken *anything* is not going away any time soon. People can’t get enough of the tasty combination of spicy and creamy. It’s a rich dish, so serving it as an appetizer is perfect! Why is it Called Buffalo Chicken Dip? The name originated back in the ’60’s at the Anchor Bar in Buffalo, NY, where they were first created. The “Buffalo” recipe was originally created for Chicken Wings. It has grown over the decades to include many other chicken recipes. What does Buffalo Chicken Dip go on? There are many vehicles to get this tasty Buffalo hot wing dip into your belly! You could also be super creative and load up an avocado with Buffalo Chicken Dip. Or how about on mashed potatoes? Nachos would also be delicious! The sky’s the limit! 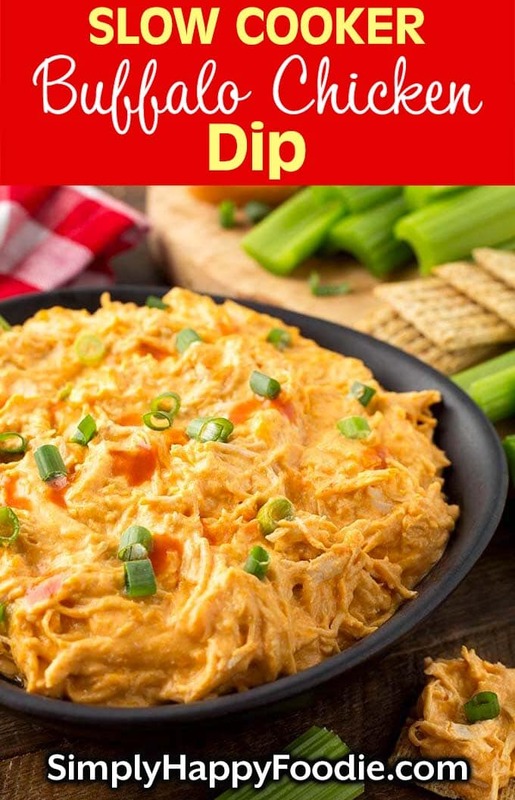 Slow Cooker Buffalo Chicken Dip is a favorite party appetizer! People love the spicy, creamy, cheesy flavors in this yummy dip recipe. 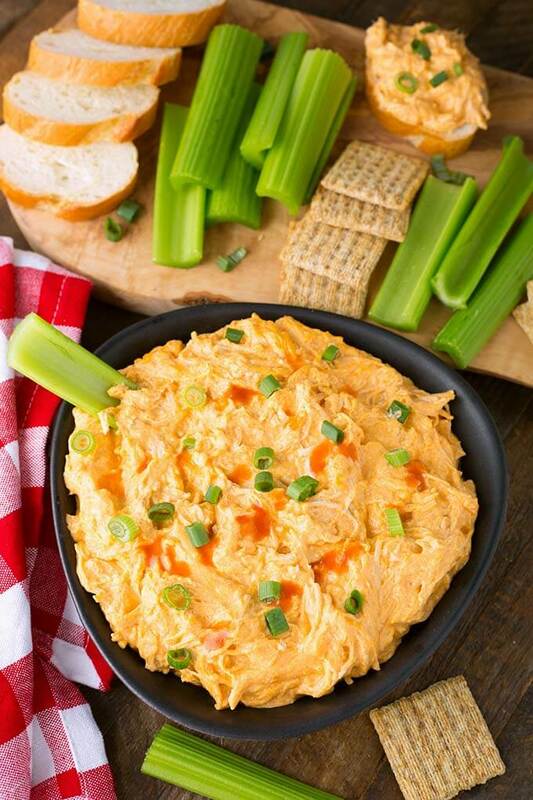 Serve this crock pot buffalo chicken dip warm, with bread, crackers, or veggies. Your guests will love it! Cut chicken breasts in half and add to a sprayed 4 qt or 6 qt slow cooker. Pour the hot wing sauce over the chicken and add the cubed cream cheese. Cook on Low for 2 to 3 hours, or until chicken is done. Remove the chicken and shred it. Then add it back into the crock. Stir well, until the cream cheese is fully incorporated. Then stir in the shredded cheese and the dressing. Let the cheese melt before serving. Keep on Warm setting and enjoy this dip on crackers, celery sticks, bread, or lettuce leaves as a wrap. Oh boy, this went over so well with my son and his friends. They ate all of it! Thank you!